As a child, summer would loudly announce itself on the last day of school. That marked a clear transition from days defined by early morning wakening and late evening homeworking to the glorious days of sleeping till ten and playing outside past dark. When that last school bell rang, it was unquestionably, officially summer. But now, in full blown adulthood, I’ve learned that it’s up to me to acknowledge the season. Nobody is going to pull me out from behind my laptop, walk me outside, and slap an ice cream cone in my hand. It’s on me—and any of us who can easily get swept up in the day-to-day routines—to partake in our own rituals that squeeze the most out of summer. This year, picking bright, sweet fruit has been my tactic. At the beginning of June, I plucked strawberries straight from the plant. A few weeks later, it was blueberries. Last Sunday, I pulled pounds of plump cherries from their branches, trying one every couple of minutes to make sure they were still good (they were). 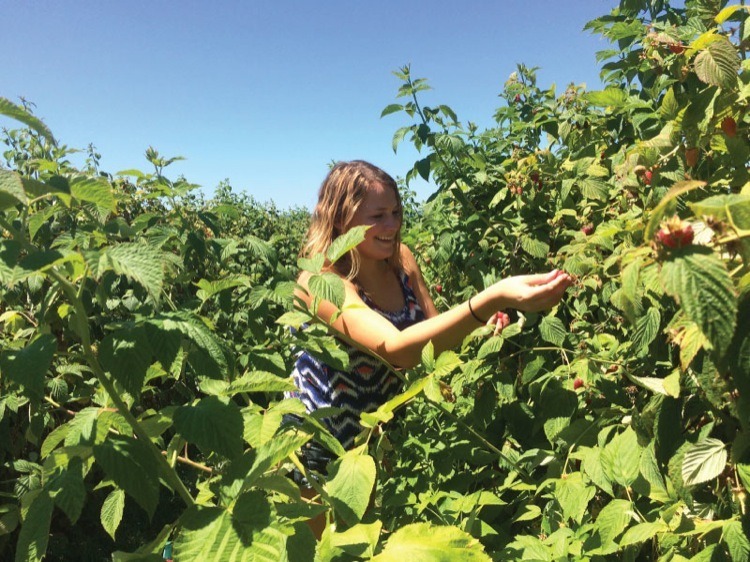 Then, my sister Maddie came to visit me in Portland this week, and we found ourselves, as we had many summers before, picking raspberries side by side. Growing up, there had always been a raspberry bush in our backyard, and we’d visit it periodically, as we went from running through the sprinkler to playing capture the flag. Raspberries—and my sister’s presence—are taking me back to those times when summer was so undoubtedly defined. Capture the flag and fireflies and soft serve ice cream and picking raspberries straight from the bush—those were the staples of my summers. This year, I’m making a point to shift my schedule to do more of those kinds of things. It feels especially important to do this now, as I’ve deemed this our “Last Hoorah American Summer” in light of my upcoming move to Denmark with Bjarke. So, instead of putting my nose in a ton of books as I usually do for these heirloom food stories, I spent many hours in farm fields instead. Maddie and I threw all of our focus into the search for perfectly ripe berries. 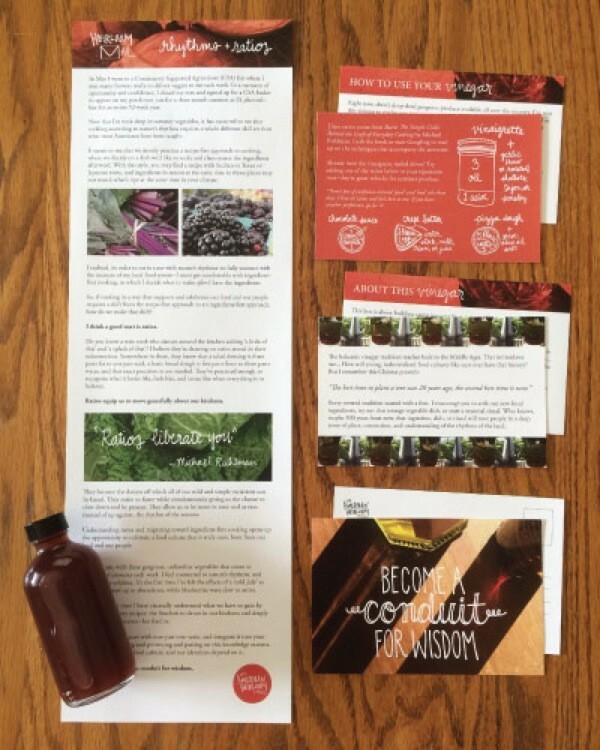 We tasted all kinds of varieties, paying attention to the subtleties in their flavors. When the sun became hot, we ate lunch at a spot in the shade. 1. Berries are unabashedly berries. They are not shy. They make their presence known. 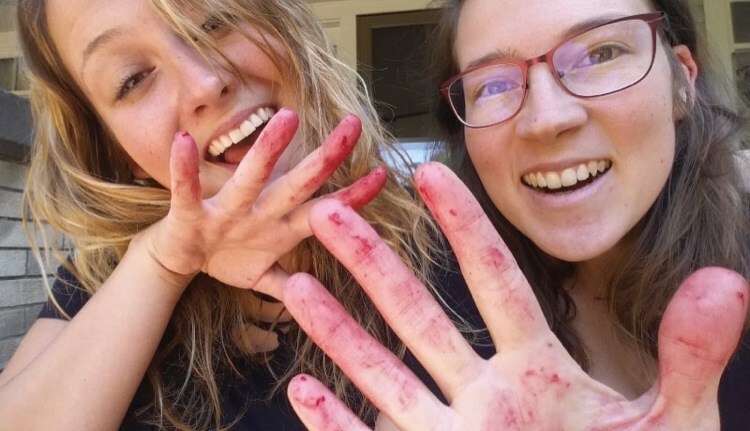 Try as you might, sometimes it’s not possible to escape a berry encounter without juice-stained hands. They get everywhere—squashed underfoot, on the corners of your mouth, or splattered across the stove and your light colored clothing. Case in point: Maddie and I left raspberry jam bubbling on the stove while we slipped outside to take the photos you see here. I had put the lid on the pot because I thought the sticky juice would jump out on the stove, and I congratulated myself for thinking ahead. 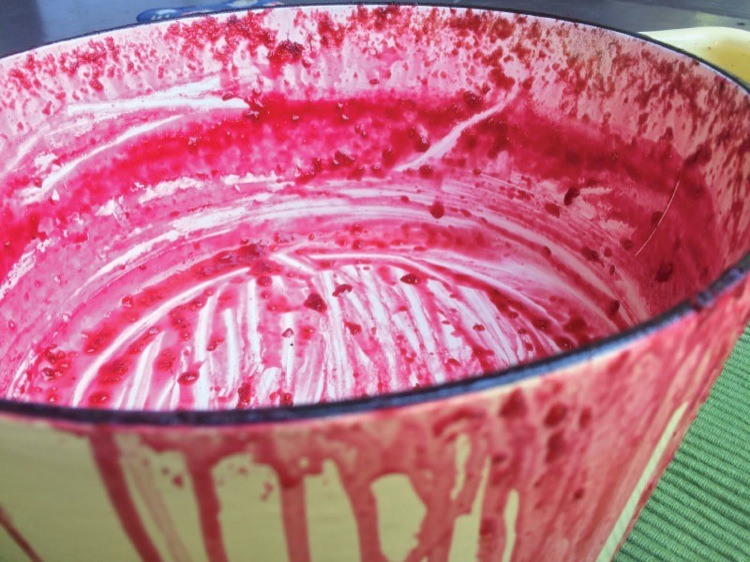 Well, not more than eight minutes later, we returned to the kitchen to find a raspberry disaster: bright pink syrup had oozed out of the pot and onto the stove, the neighboring pans, and the floor. Those raspberries were shameless in their sprawl. But at that point, what else can you do but laugh and go with the flow? 2. Raspberries have effortless beauty—you can keep the cooking simple. Admittedly, I’ve added one too many events to my calendar in the name of the “Last Hoorah American Summer.” As I scurried around the kitchen yesterday, cleaning up the raspberry disaster in preparation for a potluck, I realized that my plan to make a mixed berry compote and crispy oat topping to go with whipped cream would need to be altered. I paused to recalibrate, and I remembered how juicy, sweet, and complex those berries had tasted in the field—how Maddie and I looked at each other as we tried berry after berry, continually squealing with shock and delight at how delicious these little gems could be. Their natural beauty and flavor were enough. They didn’t need anything else. So, I took my whipped cream and snuck some of Bjarke’s homemade granola (thanks, Bjarke! ), and walked out the door with the untouched berries. Everyone loved it. When you pick ripe raspberries, you’ll notice that they easily slip off of a white, cone-like piece, leaving a cavity in their middles. 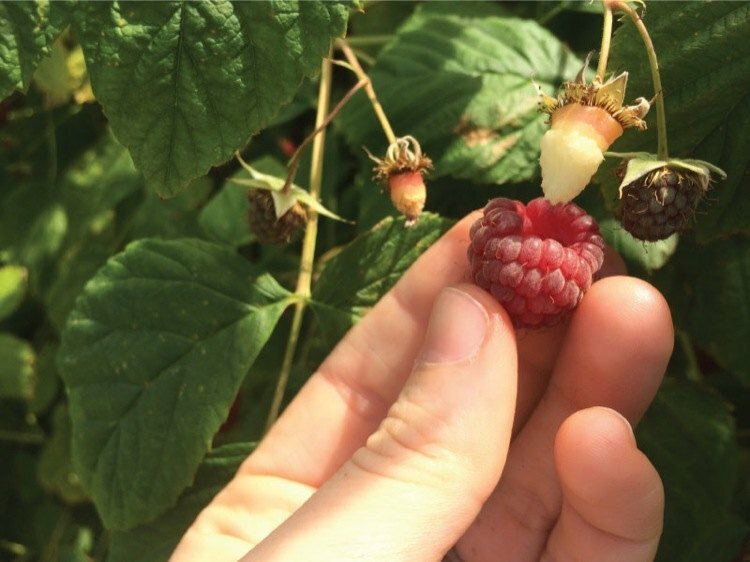 Without any interior structure to hold them up, raspberries are more vulnerable to crushing (this contrasts with blackberries, for example, which hold onto the white part of the plant that provides structure). 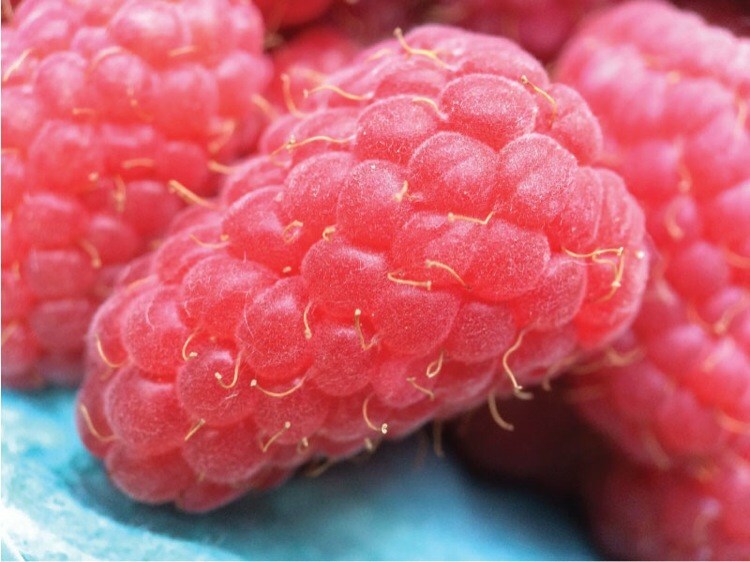 For this reason, a perfectly ripe raspberry is a precious and beautiful thing. 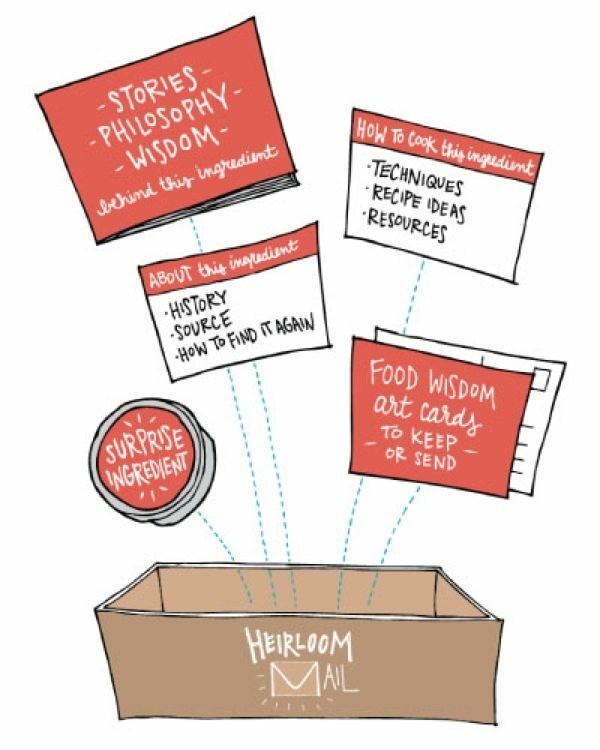 The berries we find in grocery stories are often picked very firm so they survive transport and have a longer shelf life. The flavor and the juiciness typically aren’t there. That’s why, when facing a raspberry bush heavy with fruit, it’s time to indulge. They will not taste any better than they do in that moment. Maddie and I picked 15 pounds of berries—not exactly sure what we’d do with them, but knowing that now was the time. (Update: they’re in the freezer, in jam jars, in friends’ homes, and in our bellies). 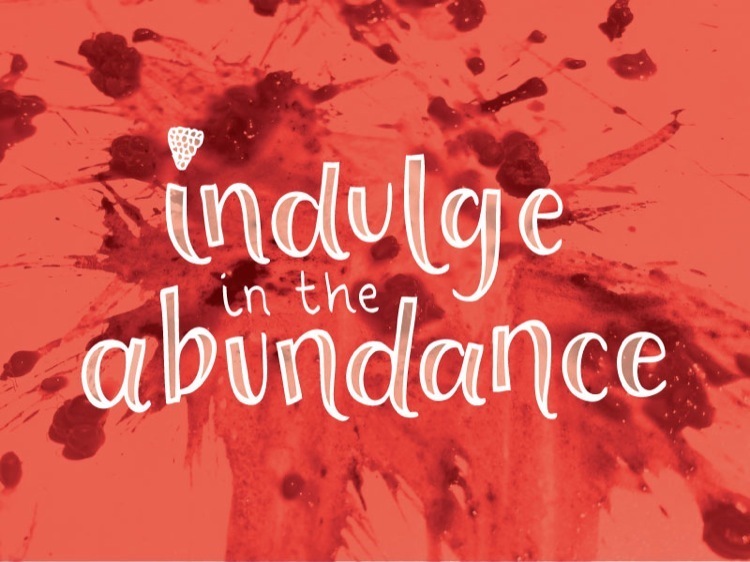 This experience of indulging in the abundance made me marvel with gratitude at what I have, what I’m able to do, and how the earth provides for us. With these lessons in mind, I wrote a few fewer words this month. I’ve pulled on my swimsuit, bathed in the long days of sunlight, and savored the bounty of technicolor fruits. I’ve opted to make time for summer. This year, I’m not letting it get away unnoticed. 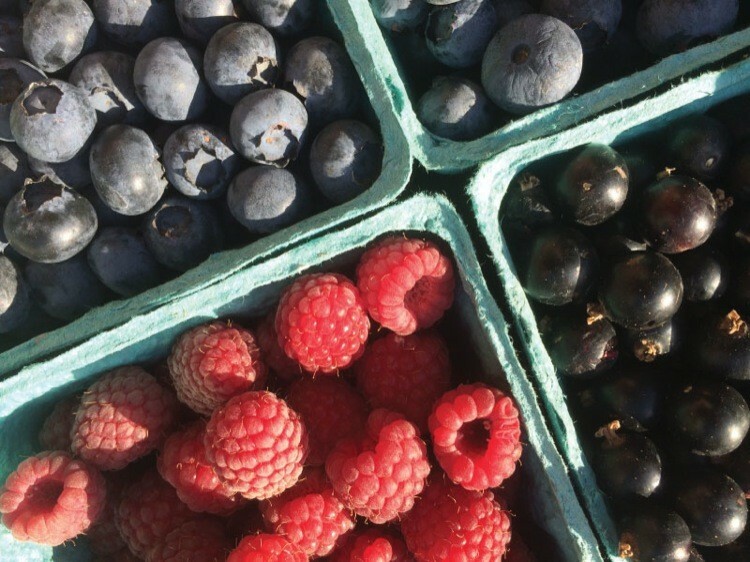 Visit a u-pick farm and harvest your own fruit. Make sure to sample as you go—you know, just to be sure they taste right. Start a ritual that marks the presence of summer. Maybe it’s a celebration of a certain food coming into season. Maybe it’s doing a routine—like eating a meal or having a meeting—outside. And maybe, if you’re like Maddie and you live in Arizona where it’s too hot to be outside—you throw an ice block party and invite your neighbors to come cool off. Take whatever cooking plan you had, and dial it back a few notches. Let the natural beauty speak for itself. When in doubt, berries always go well with fresh whipped cream. I like to do mine by hand with a whisk (long story—I’ll tell you sometime), but you can also do it with an electric mixer. Pour cold heavy whipping cream into a chilled bowl and whip until it forms soft peaks. Don’t beat it for too long or else you’ll have butter. Fold in a bit of honey or maple syrup with a rubber spatula, and serve alongside your fruit. Capture the spirit of summer by making jam. Here’s the easy raspberry jam recipe I used. Plant your own raspberry bush by following these instructions below. There’s really nothing like a fresh-picked berry. What to plant. There are two categories for raspberries: summer-fruiting (harvested in June or July) and ever-bearing (harvested in fall and summer). Research to find good varieties for your climate; the red raspberries in my photos are Tulameens and Meekers. When to plant. Dormant canes can be planted as soon as the soil is workable in early spring. If you’re using first-generation tissue-cultured plants, put them in the ground right after the last frost. Plan to harvest fruit in the second season (or occasionally in the first fall for ever-bearing plants). Where to plant. A full-sun spot will yield the most fruit. Make sure it’s protected from the wind and far away from wild berries. The soil should be well-drained—we say this a lot, but it’s especially true for red raspberries [note from Phil: that said, I do have some berries that get very wet for 1-2 days during heavy rains and they’re doing great]. To avoid disease, plant in soil that hasn’t been used to grow other bramble berries, tomatoes, potatoes, peppers, eggplants, or roses. The root system is perennial and the shoots are biennial, so while things are ever-changing above ground, keep in mind that the roots will stay for years. How to plant. Mix compost or manure into the soil a couple weeks before planting. Soak the roots for 1-2 hours, and then set them in a hole large enough for them to spread. Keep the crown 1-2 inches above the ground. Some people stake them. Space red and yellow raspberries 2 feet apart in a row, and plant black and purple varieties 3 feet apart. Leave 6 feet between rows. How to maintain. Water consistently in small amounts, rather than lots at a time. Mulch to combat weeds and conserve water. Brambles tend to take over, so cut them back if they’re creeping outside the desired area. After an ever-bearing plant is done fruiting in the fall, cut all the old canes off at ground level. For summer-bearing plants, cut off the old, brown canes in the fall, leaving the current season’s canes for next year (these plants give you fruit from 2-year-old canes). Narrow the rows to 12-18 inches so the plant maintains good air circulation. How to harvest. 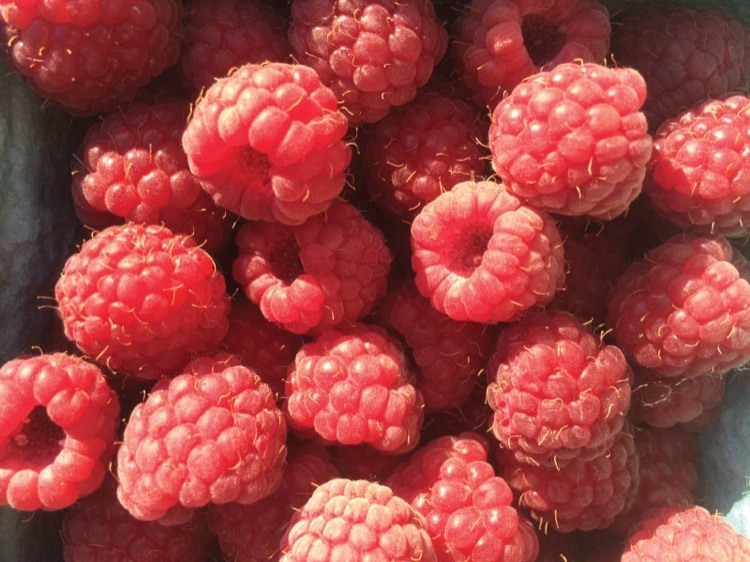 Raspberries ripen over a period of about 2 weeks, so pick them every couple of days. Harvest on a dry morning if possible. Give the berry a gentle tug, and if it’s ripe, it will fall easily into your hands. If it resists, let it ripen awhile longer. Handle the berries carefully, as they can crush easily. How to store. Raspberries can be refrigerated up to 5 days. If you’re making preserves, do it right after harvest. The berries can also be frozen by spreading them in one layer on a cookie sheet, popping them in the freezer, and then transferring them to an airtight container once they’ve frozen. Now it’s your turn: hope you have a chance to get out there and indulge in what makes summer “summer” for you.